A Devon farmer narrowly missed being hit by a car which "flew" over a wall and crashed into his farmhouse. Caroline and Andrew Thorne said the impact of the car hitting their home at Ashreigney, near Chulmleigh, sounded "like a bomb going off". Mr Thorne pulled away from the house in his tractor seconds before the impact on Sunday afternoon, the couple said. The elderly woman driver, who was the only person in the car, was flown to hospital by the Devon Air Ambulance. Caroline Thorne told BBC News her husband heard a whistling" sound seconds before the car hit the cob wall of the farmhouse. The Thornes helped the elderly woman, who was suspended upside down, escape from the vehicle. After being treated by paramedics, she was airlifted to hospital, but her injuries are not believed to be serious. Firefighters who were called to the farmhouse used specialist equipment to make the vehicle safe. Rubble from the crash was strewn across the living room of the farmhouse. 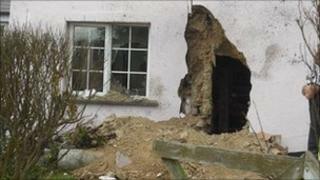 A structural engineer is to inspect the damage to the farmhouse later.